Most notably, evergreens are used in the creation of wreaths as decorations for the church during Advent. You can create small wreaths and display them upright on small wreath stands on the altar. 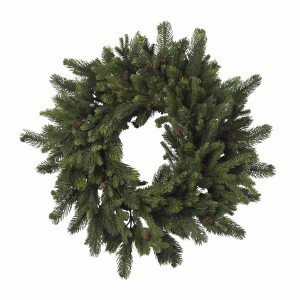 When creating wreaths out of pine, there is symbolism in the greens being laid flat and in a circle. Evergreens stand for life and, of course, the circle stands for the never-ending, eternal aspect of life. You could also make arrangements out of boxwood and holly and put them into vases. Holly during the Advent season symbolizes the crown of thorns. Topiaries made out of greens, especially boxwood, are another beautiful addition to the altar. The sculptural appearance of a boxwood topiary works well because altar arrangements are usually viewed from a distance. A boxwood topiary with ivy trailing off horizontally makes a strong but elegant and understated statement. Many denominations use poinsettias in the church during Advent. They are usually red or white. The “Advent Poinsettia” is deep red with rich green foliage. 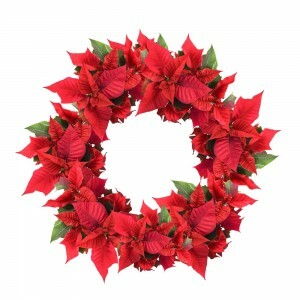 Poinsettias are used in remembrance of others. Poinsettias may be in order for the church during the season of Advent for three different reasons. An “In Memory” poinsettia symbolically remembers loved ones who have passed. An “In Celebration” poinsettia symbolizes the renewed health of a loved one who has been sick or a happy event such as the birth of a child in the past year. An “In Honor of” poinsettia honors an individual, group or specific deed–especially those who have sacrificed on behalf of others. Under these circumstances, using poinsettias in the church during Advent is embraced as a welcome symbol of people’s regard for one another. B. Ellen von Oostenburg has written features for local and state newspapers, as well as magazines, including Milwaukee Magazine, Wisconsin Trails and German Magazine. A graduate of the University of Wisconsin, Madison, she holds a B.S. in fine art.